Which is the best smartphone camera for shooting in RAW format? As smartphone’s camera becomes more powerful, it has essentially replaced the Digital Compact Camera dominated by Canon, Sony and Nikon. Today’s smartphone camera is 10 times better than the second or third generation digital compact camera, thus making it an ideal entry point for those interested in photography but doesn’t want to invest in a DSLR first. Skill is always more important than hardware, once you have the necessary skills, any picture taken with any camera is as good as what can be achieved with a simple DSLR. The first step towards being a pro in photography is to shoot in RAW. So what is RAW? RAW is a file format that captures all the data recorded by the sensor. Unlike, JPEG, there is no compression and no loss of information. For this reason, RAW allows photographers work with a wider range of colors and tones. More importantly though, RAW allows the correction of imperfections in post, including under/over exposure, the recovery of highlights/shadows, and of course temperature and tint. Skills not only includes taking the right picture as the right angel and at the right perspective, it also includes processing the image on Photoshop, bring out the best composition. The below comparison shots clearly highlight the benefits of shooting in RAW. We recommend that you select the RAW+L format, which saves a RAW image as well as a full resolution JPEG. Surprisingly the best cell phone with the best lens for taking the best photos is not Apple’s iPhone. DxOMark website provides DxOMark Mobile ratings [ Best Smartphone Camera For Photography ], mobile reviews and explanations on how DxOMark is testing camera-embedded mobile devices, and according to them, these are the smartphone with the best cameras lens for mobile photography at the time of writing. Note: Not all smartphone in the list below supports RAW. 2nd – HTC 10, Samsung Galaxy S7 Edge and Sony Xperia X Perf. Import, edit and sync the raw photos you take with your camera (Paid Feature). Craft and share pro-quality images from your smartphone or tablet using simple yet powerful tools built with Adobe Photoshop technology. Perfect your shots in a tap with more than 40 presets. 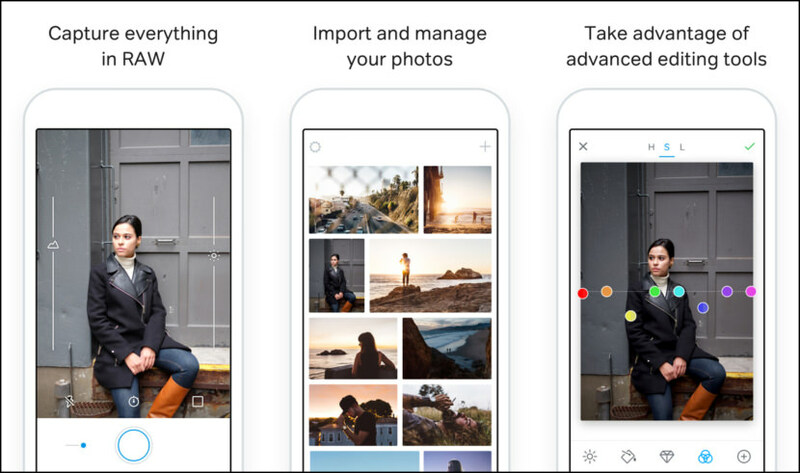 Lightroom CC for your computer – All the editing tools found in Lightroom Mobile plus additional tools that give you precise control over the color and tone of your photos with selective local adjustments, and more. Photoshop CC for your computer – The world’s best tool for combining multiple images, removing objects, and retouching your photos. Access all your Lightroom photos in Photoshop Mix, Photoshop Fix, Spark Video, Spark Page and Premiere Clip, thanks to Adobe CreativeSync technology. This photography application is by far better than Apple’s photo app. It allows you to choose 16×9 aspect ratio! Apple’s app does not and puts black bars on the top and bottom, this is 2015 Apple, get with it… I love how you can focus the light source and get a better photo. You could actually do HDR this way. Taking a HDR image with this app would be a nice new feature. Burst, Timer, Timelapse, and Video modes all with full manual controls, even during video recording! ProCam offers unparalleled control and quality with DSLR-like camera functionality and full featured photo / video editing capabilities. This app provides more control over the settings of the iPhone’s built-in camera than your old compact camera probably ever did. If you’re looking for a pro-grade camera app with neat photo and video editing features to boot, better set your sights on ProCam. MuseCam is a next generation image editor that makes it easier than ever to capture the perfect look for your photos. Shoot and edit your images using film emulating presets, professional grade tools, and advanced camera controls. MuseCam was built by a team of photographers & creatives with the understanding that stories need to be shared. We wanted to provide you the tools to tell your story, and to take your photography further. We get our inspiration from the art and people in our community. Manual Camera Tools – Custom exposure for your iPhone camera with independent control of shutter, ISO, white balance & focus. Refreshingly Simple Interface – Featuring no-import editing, a clean gesture-based UI & advanced tools made simple to understand. Create Custom Presets – Choose from presets designed by world-class photographers, or create & share your own. Tone Curves & Color Tools – Capture the perfect tone and create emotion by adjusting the HSL of each color separately. 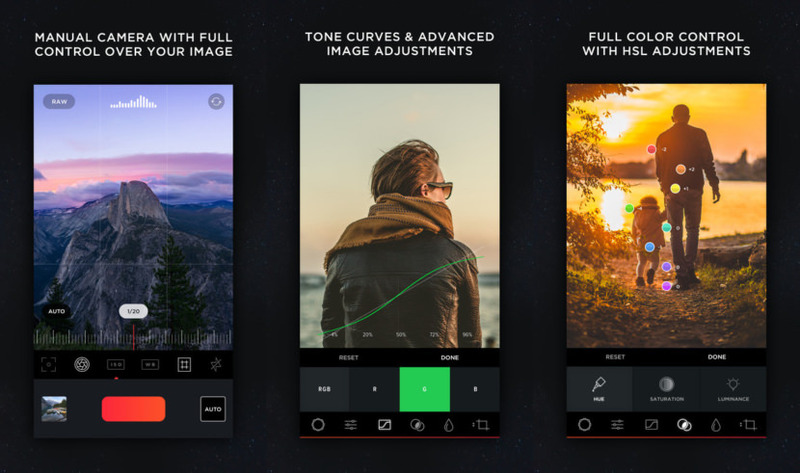 RAW by 500px is a simple and powerful photo capture, editing, and licensing workflow on your phone. 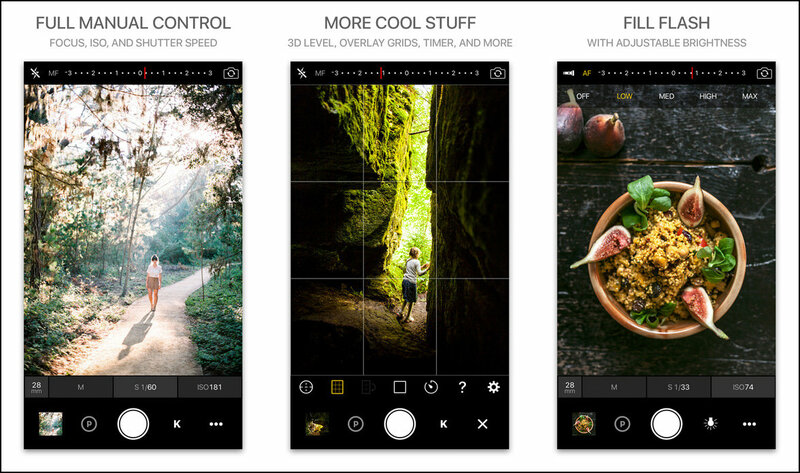 RAW by 500px brings a simple and powerful photo capture, editing, and licensing workflow to your phone. 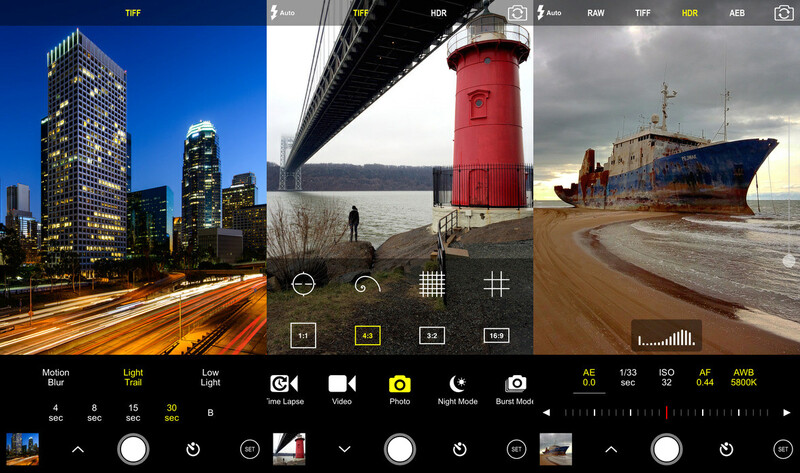 Take beautiful photos with the manual camera controls. Process your photos using the fast professional style editing controls. 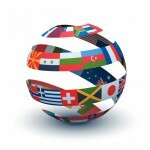 Create and manage model releases and license your photos on the Marketplace. With RAW you can. 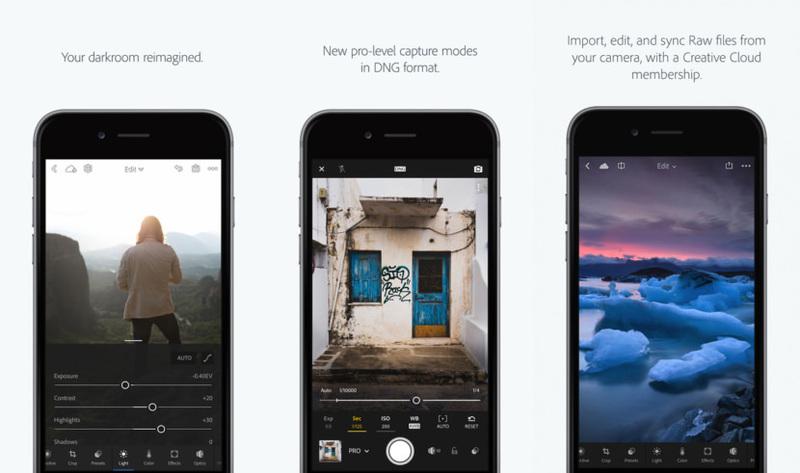 ProCamera, the gold standard for professional iOS photography, provides a highly intuitive interface for beginners as well as an impressive array of DSLR-like controls for experts. Leveraging the capabilities of the iPhone, ProCamera is easy to use, yet deep when needed! 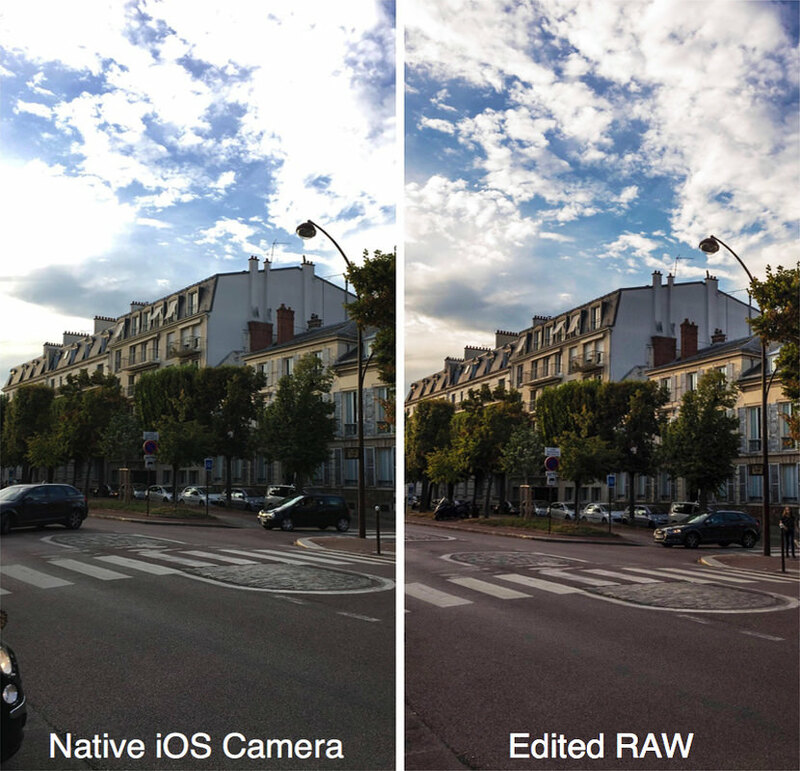 RAW Photos – Raw capture and editing opens up a whole new area for iPhone photography. Having access to the raw sensor data allows for even more creative freedom in post-processing. Dual-Lens Support – Support for the dual-lens camera system of the iPhone 7 Plus, including a Wide, Tele and Dual setting. 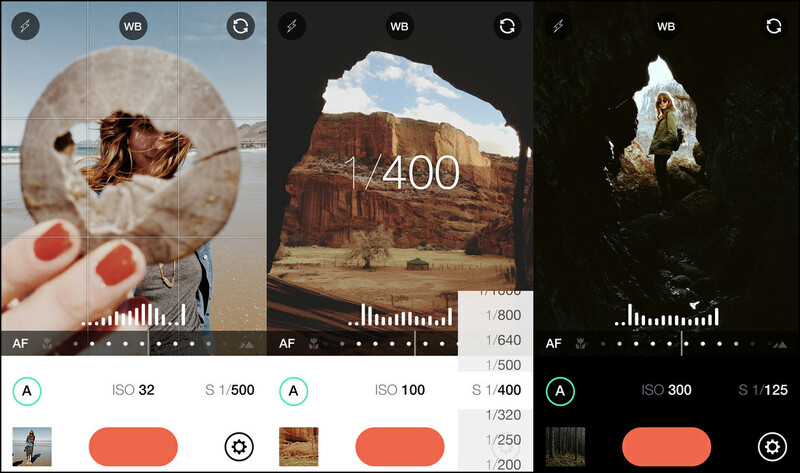 ProTimer – ProTimer allows you to capture series of photos. You can set up and start it directly on your iPhone or remotely via Apple Watch. 3D Tiltmeter – For perfectly straight photos at any camera orientation/angle. 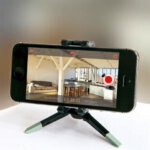 Advanced HFR video recording – 240 fps slow motion capturing (iPhone6/6+). RAW capture now available! Shoot RAW in DNG format with full control of exposure. Amazing. RAW is available on iPhone SE, 6s, 6s Plus, 7, 7 Plus. Requires iOS 10. (Manual controls available to any device iOS 8 or above). 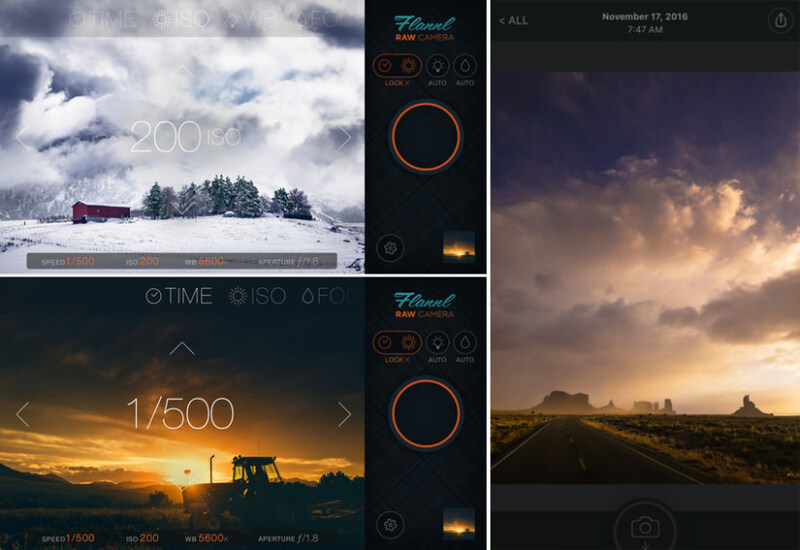 A powerful camera app with full control over your image. Quickly and simply adjust all parameters of your image. No more tapping and hoping automatic can understand what you want. Take control. 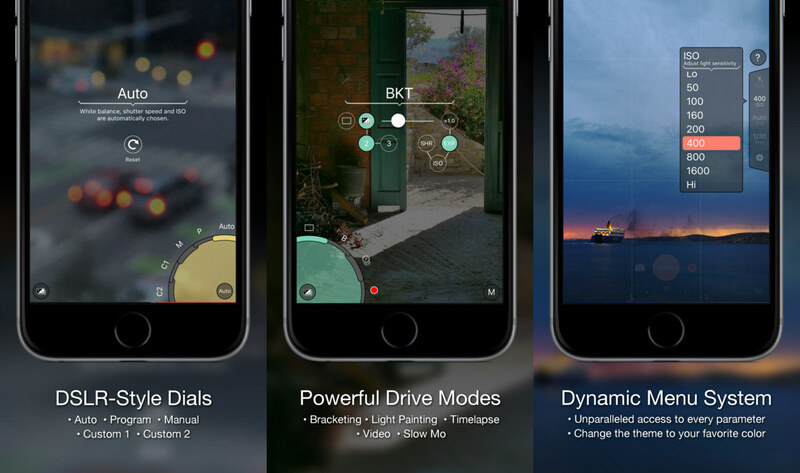 If you’re a photographer tired of trying to tap your way to the exposure you want, then this is the app for you. Fighting to get the sweet spot between a blown out background and a silhouetted subject? Stop tapping and just set the ISO and shutter yourself, you know how, stop letting your silly pocket computer decide what looks good to you. Flannl is the world’s most powerful mobile camera, available now on iPhone. 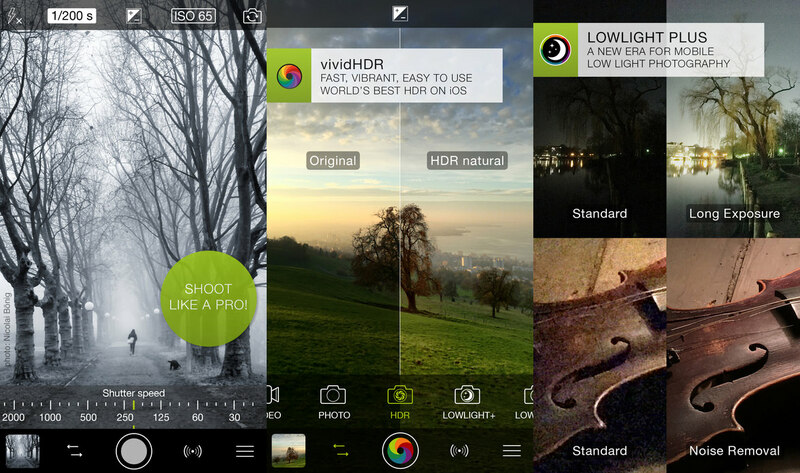 Mobile photography just took a major leap forward. Flannl RAW Camera is the most gorgeous, powerful camera you can carry in your pocket. Flannl finally brings the power of true RAW to iPhone. Flannl’s dead-simple one-handed operation means it has never been easier or faster to dial in the perfect exposure and capture your shot. Flannl Cam stores RAW images in a fully open Flannl DNG format. This means your best images can be opened by any DNG/RAW editor (in essence, any modern image editor). In addition to true RAW capture, Flannl brings a whole new way to set your camera’s manual settings. Get precise exposure control fast with the full-screen selector. Scroll left-right to choose the setting mode. These include Shutter Speed (Time), ISO, Focus, and White Balance. Then simply scroll up or down to adjust the settings for each mode. Need full auto? It’s as easy as tapping the Exposure, Focus, or WB lock buttons to clear them. Unfortunately it looks like the author simply copy-pasted DxOMark’s top 10 list and didn’t check anything at all. Only about half the phones in that list support RAW. It is possible that the author doesn’t actually know what RAW support is, they simply copy-pasted the description from yet another website, and so didn’t know that some cameras (including smartphone cameras) do not support RAW. He did say before the list that not all phones on the list support RAW. Read better before blaming the author. It is a good article. I agree. DSLR and Compact camera comes with bigger sensor, faster focusing, and better colour processing. But the best camera is always the one easily accessible, which is none other than your smartphone. No point owning an expensive DSLR but missed out crucial opportunity when it arise. This article is unsatisfactory. I am looking for the best smartphone to capture a RAW image, either in DNG format or some proprietary RAW format that Lightroom or Photoshop (newest versions) support for travel and quick photos and in a satisfactory high resolution image. This article just talks about some apps for various phones. I want to know: 1. the best SP camera with good zoom, good bright and low-light capture, high image resolution and some form of RAW capture, and, 2. what apps or native camera apps are needed to ensure that. Surely someone knows that. Dec. 2017. The best I’ve ever own is the Nokia 1020. The camera is slow, but it has 41mp, natural bokeh and good at low light. Too bad, it was discontinued by Microsoft. The best app for RAW was and still is Adobe Lightroom. Thanks for such beautiful article smart phone photography is really fun with smart camera and there are a lot camera with high mega pixel to find out it is another task which is best camera smart phone i have 10 smart phone listed below with best camera smart phone here. This is a really silly and uninformed comment. I have various high end film and digital cameras and yet also enjoy a camera phone for Instagram, and other low quality applications. A camera phone is a convenience, handy and useful. But it adds to the tools out there and doesn’t “replace” anything. what is the smart phone whose camera shoots jpeg at the best technology; intuitive year to date? my core needs a color and clarity at its best with a built in photoshop program.